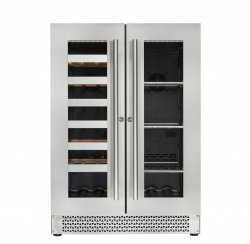 The CAV V-87WBVC - Vinoa Wine Cooler - Climate Controlled Wine Cabinet. Also inclued with this cabinet is extra shelving for the right side to provide flexibility for additional bottle storage. The extra pull out shelving will allow you to create this cabinet for wine storage on both sides. MOST These Cavavin Vinoa Wine Cabinets are designed to be built-in or free-standing. The V-265WSZ is freestanding ONLY and not meant to be built in. Please see owner's manual for loading instructions. There are shelves specifically designed for bordeaux and burgundy. Cavavin is a Canadian family run company, specializing in the wine refrigeration business since the 1980’s. Cavavin (2000) Inc. is located in Saint-Hubert, QC, Quebec City, Canada, J3Y 3X3. Vinoa Cabinets are available for shipping within the USA and Canada. Cheaper delivery may be available for your area. Please inquire with zip code and we can let you know options available. Cavavin Vinoa Shipping Notice - White Glove, set in place!!!! The delivery rate indicated for all Vinoa cabinets cabinet are for "White Glove" set in place delivery, please read section below. What may change your Cavavin Vinoa wine cabinet shipping cost? can an 18 wheeler access your home or will a smaller truck be required? What else is important to know about your Cavavin Vinoa wine cooler delivery? You may want to remove any necessary doors prior to the cabinets arrival to save time. Your ceiling height must be minimum 12” taller than the cabinet itself to allow it to be positioned into place. Additional delivery fees may be assessed for stair carries. The rate for stair carries is $60 USD per flight of stairs. One flight of stairs will be assessed from the 4th to the 15th step. Every 10 steps thereafter is calculated as another flight of stairs.